Michael R. Fischbach is professor of history at Randolph-Macon College in Ashland, Virginia, where he has taught since 1992 after receiving his doctorate in modern Middle Eastern history from Georgetown University. He researches issues relating to land and property ownership in the modern Middle East, particularly in connection with Israel/Palestine, Jordan, and the Arab-Israeli conflict. Fischbach is author of Jewish Property Claims Against Arab Countries (Columbia University Press, 2008); The Peace Process and Palestinian Refugee Claims: Addressing Claims for Property Compensation and Restitution (United States Institute of Peace Press, 2006); Records of Dispossession: Palestinian Refugee Property and the Arab-Israeli Conflict (Columbia University Press, 2003); State, Society, and Land in Jordan (Brill, 2000); was editor-in-chief of The Biographical Encyclopedia of the Modern Middle East and North Africa (Gale Cengage, 2007); and co-editor of Encyclopedia of the Palestinians (New York: Facts On File/InfoBaseLearning, e-book, 2017). His two books on Palestinian refugee property have been translated into Arabic. Fischbach also researches how the Arab-Israeli conflict was understood by Black Power advocates and left-wing white radicals in America during the 1960s and 1970s. 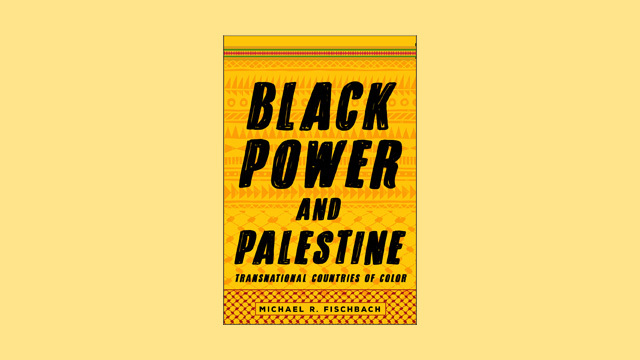 He published Black Power and Palestine: Transnational Countries of Color (Stanford University Press, 2018), and his The Movement and the Middle East: How the Arab-Israeli Conflict Divided the American Left is under contract at Stanford University Press. Fischbach has received a number of research grants and awards, including grants from The John D. and Catherine T. MacArthur Foundation (through the Institute for Palestine Studies), the United States Institute of Peace, the Joint Committee on the Near and Middle East of the American Council of Learned Societies and the Social Science Research Council, and the Fulbright Student Program. His book Jewish Property Claims Against Arab Countries was awarded Second Prize in the British-Kuwait Friendship Society Book Prize for Middle Eastern Studies, which is administered by the British Society for Middle Eastern Studies. It also was a finalist for the Gerrard and Ella Berman Memorial Award at the (American) Jewish Book Council’s National Jewish Book Awards. Fischbach’s book Records of Dispossession received Honorable Mention at the first annual Benjamin L. Hooks Outstanding Book Award Contest, which is administered by the Benjamin L. Hooks Institute for Social Change at the University of Memphis. Fischbach frequently addresses international conferences, United Nations gatherings, and the media, and has been a consultant for Middle Eastern negotiators as well as various organizations such as the Federal Research Division of the Library of Congress, the United Nations Development Programme, the Norwegian Refugee Council, the International Development Research Center, and the Adam Smith Institute. He has been a peer reviewer of manuscripts for a number of journals and publishers, and has reviewed grant proposals for the National Endowment for the Humanities, the John D. and Catherine T. MacArthur Foundation, The National Geographic Society, and the American Council of Learned Societies. Fluent in Arabic, Fischbach regularly travels to the Middle East, and has lived in Jordan and Israel.